This topic contains 0 replies, has 1 voice, and was last updated by Trinidad Administrator 3 years, 3 months ago. In a few short days al-Maghrib Institute seminars are carded to arrive on our shores where they will be directly injecting their poison of bigoted partisanship and severe misguidance into our populace. It is unfortunate that so many of the layman believe this institute to be beneficial as they deem it to be “modern” and in-tune with the plight of the Western Muslims due to their exciting methods of “da’wah” and watered down principles. 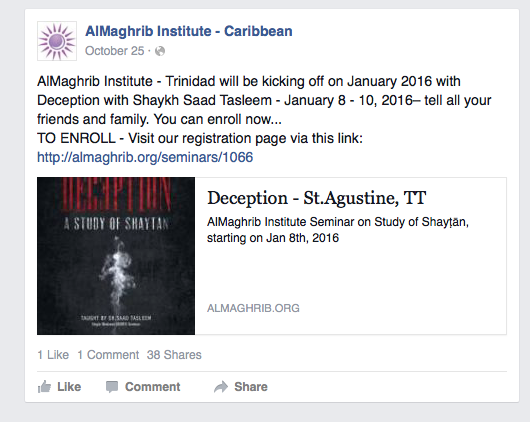 In order to fully understand the reality of this institute, we must first look at the calamitous condition of the Dean of Academic Affairs at al-Maghrib, the self-proclaimed scholar, Yasir Qadhi. To those who have some knowledge of the fundamentals of this pure deen, his misguidance is as clear as the sun in the sky, but for the majority of unsuspecting laymen – particularly in Trinidad & Tobago – he is from the best “scholars” in the West. By the Permission of Allāh, we hope to dispel the doubts some of our brothers and sisters might have regarding the reality of al-Maghrib Institute such that they may be upon clarity and thus understand the fact that this institute is misguiding our youth, regardless of how they embellish their falsehood. In our first instalment, we will look at an article entitled, “Once they replace our scholars, where will they take us?” written by our noble brother and teacher Abul-‘Abbaas Moosaa Richardson (may Allāh preserve him) where he expounds on how al-Maghrib endeavours to separate the Western Muslims from the real scholars of Islām so that they can be the sole reference point and thus make it easier to push their agenda. We wholeheartedly implore the seekers of truth to read this highly beneficial article.